Our limiting beliefs or beliefs about ourselves that have a limiting view of who we really are, can also be described as the little voice or internal dialogue inside us that is fueled by fear, judgement, and self-deprecating attributes. 1. The most damaging way is when we are not even aware they are operating in the background. It is like having a spyware in our operating system skewing our reality and sending false information about who we are. We truly believe these messages: I am not good enough, people don’t like me, I’m not strong, I must be perfect to succeed, life is not fair… These generalizations become entrenched in our subconscious consequently we get a skewed generalization about life which in turn creates a vicious circle of negativity breeds negativity. 2. The second way, we have become self-aware of their existence and how they sabotage any inkling of ambition we have, we can hear the voice. We recognize it. It even has a name: fear and we have accepted that it has slowly inserted itself into our brain like some sort of alien implant. The problem is, we don’t know how to get rid of it. It is a little bit like stepping into crap, you know the crap doesn’t serve any purpose to your shoe, but it is very difficult to get rid of. Our beliefs are constantly influencing our thoughts, feelings and ultimately our behaviour. The choices we make are governed by those beliefs. How can we use the power of these beliefs to our advantage? First and foremost we have to become self-aware, that is the first step in the journey of changing our script. When we can look at these limiting beliefs in the eye and recognize them for what they are, we can then slowly but surely eliminate the gremlins from our rearview mirror and go forward confidently. Let’s take the example of “I’m not good enough.” When you feel this way about something, pause and consciously challenge this belief, re-evaluate the evidence, give yourself examples of times where you did something very well and people really valued you. Don’t try to find fancy examples, you helped someone and they really appreciated what you did, the point of the exercise is to realize that it is very unlikely that “we are not good enough” for EVERYTHING we do. The more you reflect on when these beliefs have shown to be incorrect the more you will recognize them as they show up. The interesting part is that the more self-aware we become the more confident we become. It is like strengthening your endurance when you train for a marathon, the more you train the longer you can run. Your self-deprecating attributes get replaced by a sense of self-worth, consequently, you feel more in charge of your own life. For example, practising mindfulness meditation helps us be more focused, even if it is only 15 minutes a day. The calming effect of focusing on your breath, closing your eyes and letting go of control, helps achieve a clear mental state that has a great impact on your stress level, and anxiety. Meditation gives you a sense of wellbeing, the increasing amount of quantifiable research that mindfulness has on the brain and body is one of the major reasons why mindfulness programs have become more prominent in the corporate world. Seek out tools to help you make small changes to help you change your script, one word at a time. Other tools could be engaging in something you feel you are good at (such as a hobby). The more you become self-aware of what you are good at, the more confident you will become. The sense of feeling good about yourself overpowers the limiting beliefs of not being good enough. Take mental notes on how you judge yourself and others. 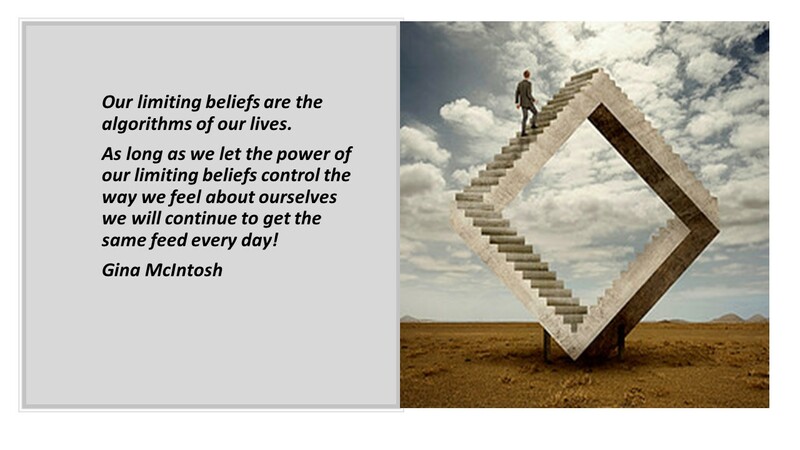 What kind of limiting beliefs do you have about you and others around you? The more you know yourself the more you will be able to see how other people see you and it will help you have better personal and professional relationships. Knowing yourself means understanding what makes you tick: your own needs, desires, failings, acknowledge your vulnerabilities as they arise. Brene Brown wrote, “Vulnerability may seem weak, but it’s boldness, courage, and strength all wrapped in an unexpected package”.